Capacitive-based liquid level sensing is making its way into the consumer, industrial, and automotive markets due to its system sensitivity, flexibility, and low cost. With using TI’s capacitive sensing technology, the system flexibility allows designers to have the choice of placing the sensors directly on the container (direct sensing) or in close proximity to the container (remote sensing). Each configuration has its own advantages and disadvantages. 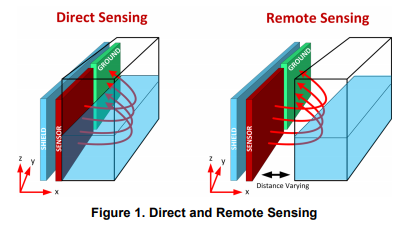 This application note highlights the system differences and performance of direct and remote sensing to provide guidance in how capacitive-based liquid-level sensing is affected. This entry was posted on Sunday, July 1st, 2018 at 5:00 pm	and is filed under app notes. You can follow any responses to this entry through the RSS 2.0 feed. You can skip to the end and leave a response. Pinging is currently not allowed.